Celebrity chefs are crowd pullers. You’re damn right there. But, it’s the “guest experience” that the Manager is responsible for (and creates) that keeps you happy and when you leave, it’s that very same guest experience that brings you back with friends and/or those you love. 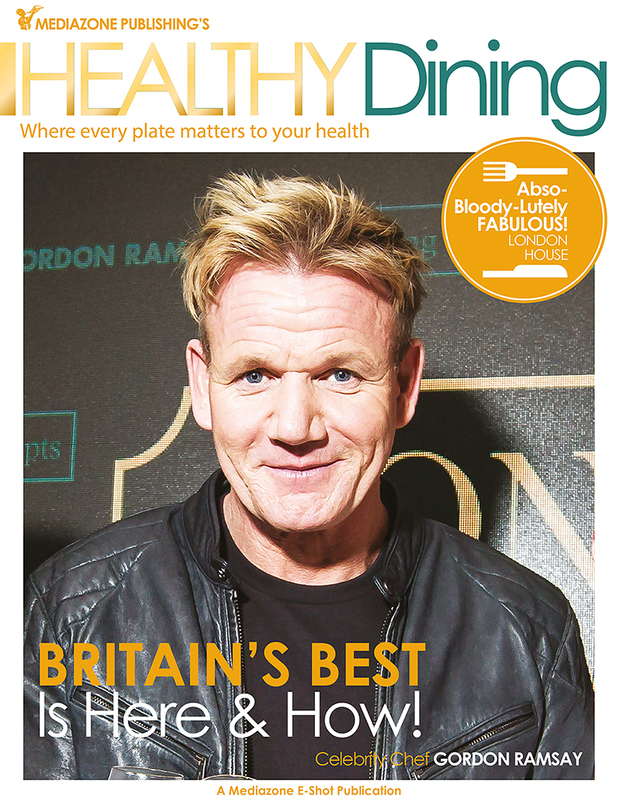 Gordon Ramsay knows that, which is probably one of the main reasons he picked to partner with Dining Concepts led by local entrepreneur and restaurant czar Sandeep Sekhri. How could he have chosen another? Sekhri’s expansion and growth over 10 notable years has emerged from great trial, error and strife, making Dining Concepts more of a miracle than a success. Such tried and tested partners are hard to find so Ramsay’s foray into the already over-crowded market may well have been written in the stars. A stone’s throw away from the Tsim Sha Tsui (East) MTR station, London House sits on Kowloon’s sunlit waterfront. There is a mild chill but we brave on to pass the line of eateries dotting that coveted location. The only restaurant that’s full is Gordon Ramsay’s London House, a fact that in itself raises the bar. A brief wait later the restaurant manager Andrew Curtis appears to guide us to the only unoccupied table on the first floor. The décor is quintessentially British-pub-like. A mouthwatering strain of a freshly baked Shepherd’s Pie wafts past and trays laden with fish and chips, sausage rolls, mini burgers and pints of ale whiz past on their way to happy tables. Merriment is alive as are the large tv screens showing football matches. The ocean sends its cool winds across the waves as we settle in to enjoy Brunch. Radishe’s Bloody Mary is our choice of drink instead of the usual Bombay Saphire. Vodka, mixed vegetables juice with fresh radishes and house Bloody Mary mix takes the glass beyond compare. For the mains, we request the traditional Shepherd’s Pie, Bangers and Mash, Fish and Chips (of course), Beef Burger and Sausage Roll and pumpkin soup. The HP Sauce was handy and in no time, the afternoon took on a merry, near nostalgic hue. Fittingly, the view from the restaurant led the imagination to that fateful July of 1997 when the Union Jack eased into history, taking with it much of what good our British friends did here. This meal made me miss my British friends with whom I had many laughs, a few pints, read Viz and wept into many spicy curries. If the restaurant manager is the chief architect of the guest experience then applause is due to the demure Andrew Curtis for whom hospitality seems a passion. A hands-on manager, he is easy to like, his staff say. Leading from the front, he’s seen waiting on tables, taking orders, chatting up customers, clearing bills and everything else that a manager does. Curtis betrays none of the trappings that managing a celebrity’s restaurant would. Ever the student of life, his fun comes from learning, putting smiles on faces and the belief that Dining Concept’s top management trusts his vision, instincts and respects his decisions. He treats his staff just as fairly and doesn’t ask them to do what he himself would rather not. His style and flair transcend his capacity and earn the respect of his team, which in turn serve patrons with patience, understanding and the respect they deserve. 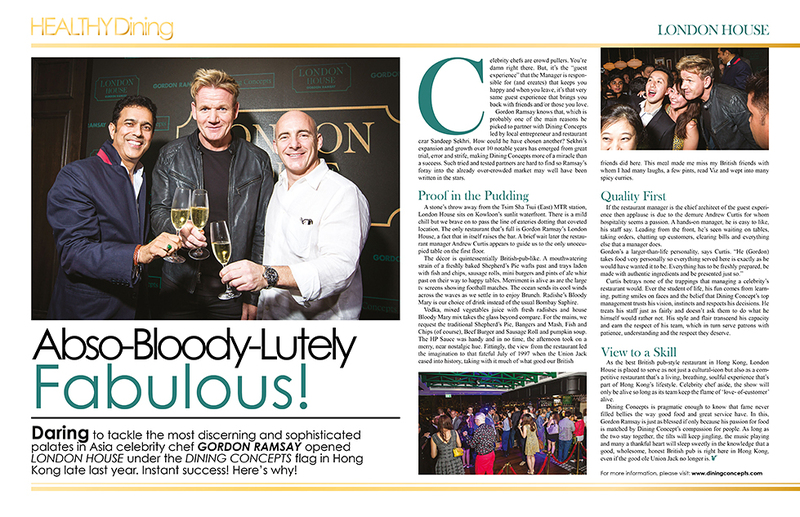 As the best British pub-style restaurant in Hong Kong, London House is placed to serve as not just a cultural-icon but also as a competitive restaurant that’s a living, breathing, soulful experience that’s part of Hong Kong’s lifestyle. Celebrity chef aside, the show will only be alive so long as its team keep the flame of ‘love- of-customer’ alive. Dining Concepts is pragmatic enough to know that fame never filled bellies the way good food and great service have. In this, Gordon Ramsay is just as blessed if only because his passion for food is matched by Dining Concept’s compassion for people. As long as the two stay together, the tilts will keep jingling, the music playing and many a thankful heart will sleep sweetly in the knowledge that a good, wholesome, honest British pub is right here in Hong Kong, even if the good ole Union Jack no longer is. To describe someone as Swiss as Max Liechti as a 'son of the soil' in a Hong Kong based publication sounds ridiculous. But then again, he seems to embody all that Hong Kong stands for: resilience, can-do attitude, evangelistic zeal etc are only some of the few superlatives that can be used to describe his indomitable spirit. He would have had to posess such a thing. Although staunchly Swiss, Liechti returned to his spiritual home in the Special Administrative Region when he received a call from senior management at the Royal Pacific Hotel and Towers in Tsim Sha Tsui's China Hong Kong City complex. 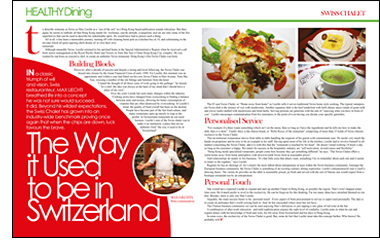 He was wanted by top brass as executive chef, to create an authentic Swiss restaurant. Hong Kong's first Swiss Chalet was born. However, after a decade of success and despite a strong and loyal following, the Swiss Chalet was forced into closure by the Asian Financial Crisis of early 1998. For Liechti, this moment was an opportunity and within a year had fitted out his own Swiss Chalet in Hart Avenue, Tsim Sha Tsui, rescuing a number of the old fittings and furniture from the hotel. "I hated the thought of all those years of work going to the garbage," he mused. "As a chef, the idea was always at the back of my mind that I should have a place of my own". Over the years Liechti has seen many changes within the industry. Cooking styles have changed from overcooking to finding a balance between taste and texture, allowing for better consumption of vitamins that are often destroyed by overcooking. In Liechti's mind, the quality of food overall has been on the decline. People have become part of the fast food culture, and many restaurants open up merely to reap in the profits. In Switzerland restaurants do not need licences. Liechti's aim of the Swiss chalet was to make it an institution, a place that serves authentic food "the way it used to be in Switzerland". The 65 seat Swiss Chalet, or "Home away from home" as Liechti calls it serves traditional Swiss home style cooking. The typical omnipresent Swiss dish is the emince of veal with mushrooms. Another signature dish is the beef tenderloin with herb cheese sauce (made of goats milk and clover leafs) stuffed with mushrooms and fresh herbs. Serving portions are generous with the aim of "enjoying what you have in front of you". Liechti encourages communication from his customers, to the point of even having you dictate your specific garnishes. "For example if a diner wants something which isn't on the menu, then so long as I have the ingredients and he tells me how to make the dish, then it is done". Finally there is the cheese board, or "Rolls Royce of the restaurant" comprising of more than 25 kinds of Swiss cheeses exclusive to the Swiss Chalet. This no-nonsense restaurateur moves from table to table handling the requests of his guests with consummate ease. He seems very much the hands on-proprietor and he tries to be an example to his staff. Having spent most of his life in the kitchen, Liechti had to involve himself in all matters concerning the Swiss Chalet, and it is with this that the "restaurant is touched by his heart". He doesn't mind working 24 hours a day so long as his customer is happy. His tenets for success in the hospitality industry are "self motivation, inventiveness and flexibility". "Hong Kong needs specialised restaurants; people come here because they get something different" he says. 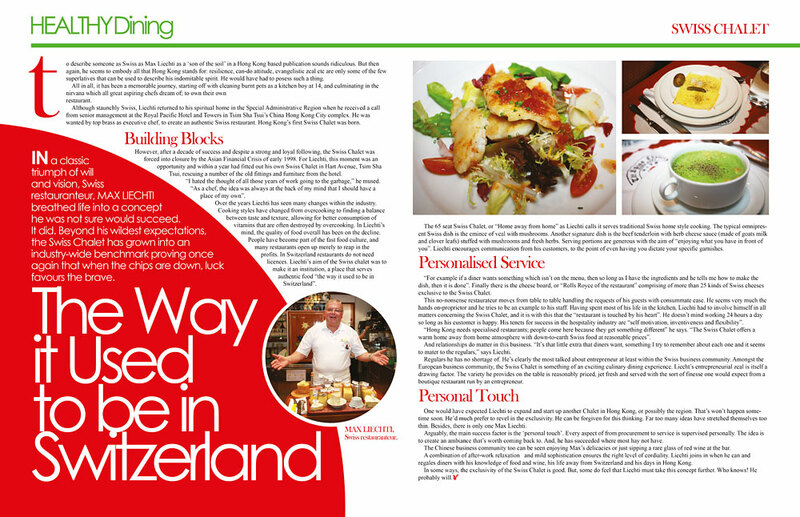 "The Swiss Chalet offers a warm home away from home atmosphere with down-to-earth Swiss food at reasonable prices". And relationships do matter in this business. "It's that little extra that diners want, something I try to remember about each one and it seems to mater to the regulars," says Liechti. Regulars he has no shortage of. He's clearly the most talked about entrepreneur at least within the Swiss business community. Amongst the European business community, the Swiss Chalet is something of an exciting culinary dining experience. Liecht's entrepreneurial zeal is itself a drawing factor. The variety he provides on the table is reasonably priced, jet fresh and served with the sort of finesse one would expect from a boutique restaurant run by an entrepreneur. One would have expected Liechti to expand and start up another Chalet in Hong Kong, or possibly the region. That's won't happen sometime soon. He'd much prefer to revel in the exclusivity. He can be forgiven for this thinking. Far too many ideas have stretched themselves too thin. Besides, there is only one Max Liechti. Arguably, the main success factor is the 'personal touch'. Every aspect of from procurement to service is supervised personally. The idea is to create an ambiance that's worth coming back to. And, he has succeeded where most hay not have. The Chinese business community too can be seen enjoying Max's delicacies or just sipping a rare glass of red wine at the bar. A combination of after-work relaxation and mild sophistication ensures the right level of cordiality. Liechti joins in when he can and regales diners with his knowledge of food and wine, his life away from Switzerland and his days in Hong Kong. In some ways, the exclusivity of the Swiss Chalet is good. But, some do feel that Liechti must take this concept further. Who knows! He probably will.